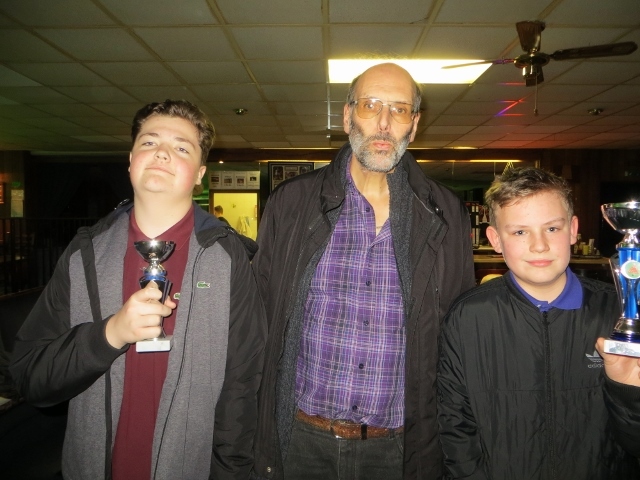 TWO friends from Gosport battled out the Plate final in the sixth legs of the Cuestars South of England Under-21 Gold, Silver and Bronze Tours at Top Spot Snooker Club, Havant. English Under-14 Championship finalist Olly Gibbs prevailed 2-1 against Brett Wallace. Gibbs, 13, had missed out on qualifying for the knockout from his Gold Tour group while 16-year-old Wallace, on his Silver Tour debut, had beaten the then rankings leader Ryan Hughes (Chandler’s Ford). For more information about event sponsor Trevor Sanders Snooker & Pool Table Services, visit www.sanderspooltables.co.uk/. The seventh leg of ten is at Fareham Snooker Club on Sunday, February 26. PRELIMS: Nat Kidner (Greenbaize, Bournemouth) beat Arron Smith (Selsey RBL, Chichester), Olly Gibbs (Chandler’s Ford SC) beat O’Shay Scott (Chandler’s Ford SC), Thomas Saunders (Stepfield SC, Witham, Essex) beat Cameron Holt (Liberal Club, High Wycombe), Will Forster (Mayfair, Gosport) beat Arnie Petty (Salisbury SC). QUARTER-FINALS: Gibbs beat Kidner, Shane Kearns (Jesters, Swindon) beat Callum White (Copnor SC, Portsmouth), Saunders beat Keegan Reed (Salisbury SC), Brett Wallace (Fareham SC) beat Forster. SEMI-FINALS: Gibbs beat Kearns, Wallace beat Saunders. FINAL: Gibbs 2 Wallace 1. Picture by Tim Dunkley. From left: Brett Wallace, sponsor Trevor Sanders, Olly Gibbs.